One very simple way of making your wedding day planning a little bit easier is by deciding a color theme for the big day. A good color palette is going to give your reception and decorations a more unified look and it’ll guarantee you have an elegant and glamorous wedding. If you are still thinking about the color to go with, you should check out these five amazing color ideas. These are really trendy right now and will help you create an amazing look for your special day. One of the trendiest colors for 2014 is definitely mint. 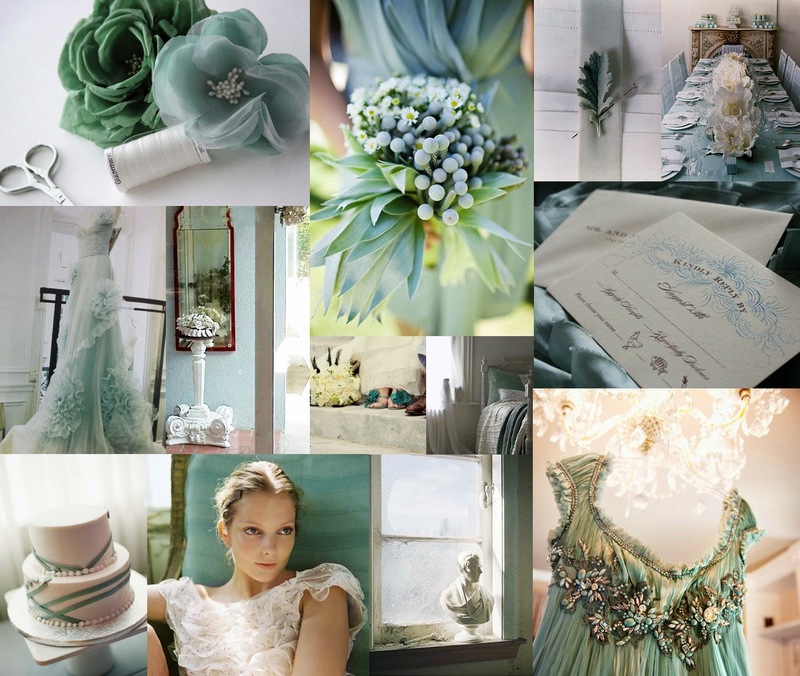 This “Mint-spiration” is a really fresh and bright color and it suits a spring and summer wedding perfectly. There are really plenty of ways you can go about using mint. You can either use it together with a more toned down color, such as gold. This will give your wedding a more sophisticated and elegant look. But if you are looking for some quirkiness then you should definitely combine mint with other bright colors, such as marigold. Gold is a very stable and safe color to choose for your special day. It is often very easy to incorporate as part of your decorations and it adds plenty of glamour for your big day. In 2014, gold is also made more fun by using plenty of glittery shine with the gold. This adds a nice sparkle for your special day and it can look a bit different to just using a polished gold on its own. There have been plenty of different ways to use blue as your wedding color. And in 2014 it is all about soft, dusty shades of blue. This is a really lovely color that you should definitely consider using in your spring, summer or even winter wedding. Dusty blue is also a good color for your special day because you can so easily incorporate it to the groom’s dress as well. Dusty blue suits are really popular right now and will suit most men very well. Try combining the blue together with a soft peach, for example. If you like to use a more powerful color then you should consider a strong orchid for your special day. This is a really trendy color option to go with. Orchid also offers you a simple way to include the color for your wedding décor with flowers. Orchid flower arrangements will look really beautiful, for example. If you want to mix colors then orchid and gold are a beautiful color combination to go with. Another big color comeback in 2014 is definitely pink. The romantic feel that the pink color theme gives to your wedding is really going to wow your guests. It adds such a nice feminine touch for your wedding and really makes the day feel more romantic. Some popular accent colors for pink are black, grey, navy blue & chocolate brown. If you are looking to finalize your special day with some amazing music entertainment then contact us TODAY! We can help you locate the best wedding venues in Hudson Valley and we are an experienced Hudson Valley wedding DJ & MC husband and wife team to help you create & celebrate the best day of your life! What colors have YOU chosen to represent the BEST day of your life? I’d love to hear from you!